I'm not the biggest Miley Cyrus fan, but my little sister in my sorority won tickets to her Bangerz tour at the Amway Center in Orlando last night and invited me to go with, so naturally I said of course! I do like most of her new songs, but I wouldn't have paid to go to the concert, but who turns down free tickets!? They weren't great seats, but good enough to see all the ridiculous action taking place on stage. The show was what I expected times ten. The props, her outfits and Miley in general were all crazy to say the least. The show wasn't close to being short of twerking and crotch-grabbing, but that's basically what Miley seems to be all about lately. During the song "Adore You" she told the crowd to make out with whoever you came with. Then cameramen proceeded to go around the crowd and put couples up on the big screen who were following Miley's orders. You can only imagine what some people were doing to get on that screen. During another point in the show, she took swigs of water from her water bottle and spit it out all over the front rows of the crowd. Most of her outfits incorporated a revealing, over the hip leotard of some kind. She also had a few different pairs of cowboy boots, J's and heels. Check out the pictures in this post (not ones that I took) to see for yourself. Her back-up dancers included little people, giant dancing teddy bears, and girls who could twerk better than anyone I've seen before. She also had crazy props like a Miley tongue slide which she slid down to start the show, a giant gray wolf, a massive bed and a floating hot dog that she rode on. Even though I'm not the biggest Miley fan, I still had a lot of fun watching the performance. It was definitely entertaining to see all the different props, and it was a great place for people watching too. I wouldn't recommend it for anyone who's not in high school yet though, because it was pretty explicit for young ages. Other than that, it was definiltey an experience that I won't forget and will probably be the most outrageous concert that I'll ever attend. 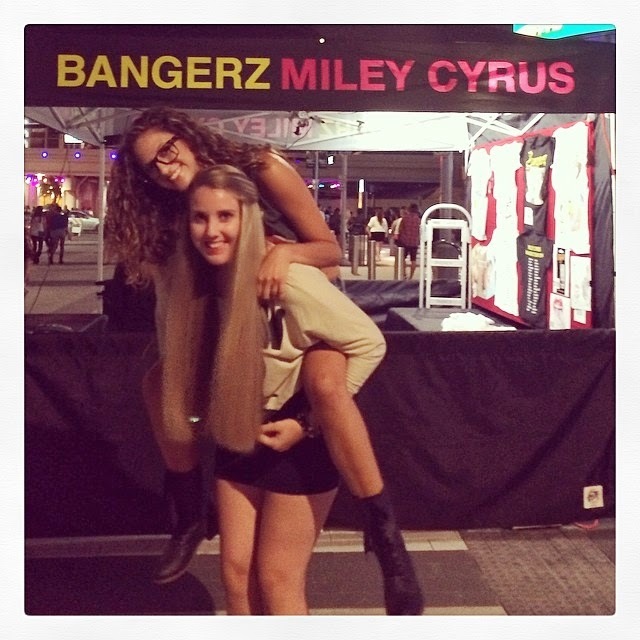 Are you going to see Miley on her Bangerz tour? What are some of your favorite performers? Wow, that looks insane! Not sure if I would want to go to it, but you are right not to turn down those tickets! I bet you gonna have so much fun there!!! I was just at her show in Atlanta on Tuesday! We had floor seats & I was able to get a pretty good video clip, it's posted on my fb page, check it out.